Song Lyrics from FROZEN- Do You Want to Build a Snowman? 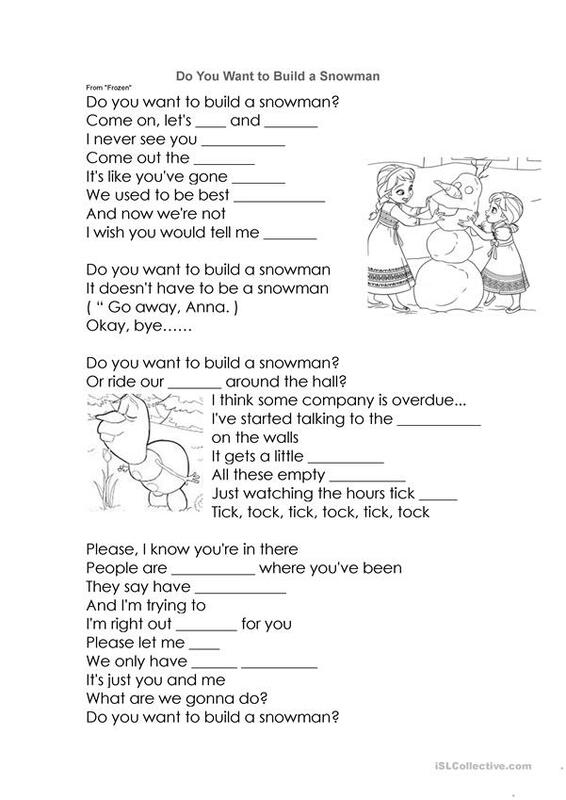 It's an exercise for students to fill in the missing words while they are learning this popular song: "Do You Want to Build a Snowman?" The above printable, downloadable handout is best suited for elementary school students and kindergartners and nursery school students at Beginner (pre-A1) and Elementary (A1) level. It was designed for working on your class' Listening, Spelling and Reading skills. yunyunlineve is from/lives in Taiwan and has been a member of iSLCollective since 2012-08-10 18:50:44. yunyunlineve last logged in on 2019-04-22 06:39:14, and has shared 1 resources on iSLCollective so far.